It improves soft tissue and joint mobility. It has been known to treat chronic conditions thought to be permanent. Who Is Using the Graston Technique? At last count 270 Professional and Amateur Sports Teams/Organizations use GT. This includes the NBA, NFL, NHL, MLS, the PGA Tour, and CityPT! Check out the Graston site for a full list. Ok. You are interested. So what exactly is Graston? 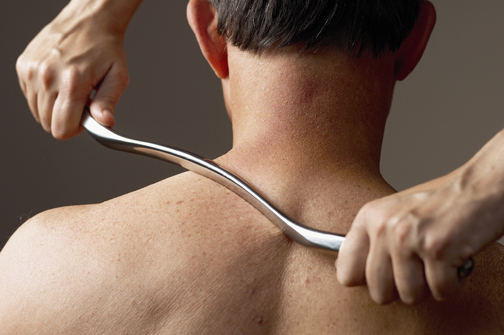 Graston technique is a form of instrument assisted soft tissue mobilization used to break down scar tissue and fascial restrictions to treat both chronic and acute soft tissue conditions and injuries. The Graston procedure allows us to detect and treat problem areas in the muscles, tendons and ligaments that can reduce range of motion and cause pain. During normal healing, our body creates scar tissue in the process of repairing an injury. Much the way a cut will scab over on your skin, scar tissue can form in the muscle and surrounding soft tissue areas. Whereas the scab on your skin will eventually fall off, remnants of this scar tissue may stay behind in your muscles and ligaments as adhesions or fibrotic nodules. Because the Graston Technique uses contoured and beveled stainless steel instruments that are shaped to the patient's body parts, it allows the PT to focus the treatment on the patient's problem areas. The instrument's beveled edges and specially designed shapes allow the PT to treat the affected areas directly and more precisely, which increases the efficacy of the treatment. Just as a stethoscope amplifies what a physician can hear, so do the Graston instruments amplify what the PT can feel. Because the Graston instruments are made of metal, they resonate like a tuning fork, which allows the treating PT to assess, diagnose and treat the injury more accurately. As opposed to using the soft fleshy pads of the hands that will compress on contact, utilization of the Graston Instruments allows the PT to use less pressure to pinpoint soft tissue restrictions and access even deeper restrictions than possible with the hands alone, resulting in a more comfortable experience for the patient. Combined with strengthening, flexibility and muscle re-education the Graston Technique can result in a faster recovery to pre-injury levels of activity. A patient on average is treated twice a week, and most will start to feel noticeable results within 4-5 weeks. However, some patients feel immediate relief of symptoms. Dan Tahany, Director of CityPT, is a bit of a skeptic. He has seen many physical therapy gurus in his 15+years as a PT who claim to treat just about every condition known to man with their 'special technique," "new procedure," or "new medical device." He usually nods, bites his tongue, and sticks with time tested treatments that have shown the best results in clinical studies. While he had heard of Graston for a number of years, he thought of it as another type of soft tissue mobilization (massage), something he did with his hands everyday. How could a metal instrument be more sensitive and therapeutic than his own hands? About two years ago Dan was suffering from Achilles Tendonitis. Being the good PT he is, he treated his own injury. He started with rest, ice, ultrasound, and heel lifts in the acute phase and progressed to massage, rolling, stretching, and eccentric strengthening in the more chronic stages. He checked and did corrective exercises for his foot, his knee, his hip and lower back. Despite all his efforts, it just wouldn"t go away. It was preventing him from running, training in martial arts, and it just plain hurt. One day, as JoAnn Yanami, PT was putting away her Graston Instruments, Dan said, "hey JoAnn, would you mind working on my Achilles a bit?" In less than 10 minutes the pain was 75% better. In 10 minutes he had made more progress than he had in the previous 5months. Dan couldn"t believe the "crunchiness" he felt in his Achilles and his calf muscle. He had spent hours massaging his Achilles and calves, and never felt any of these tiny soft tissue adhesions. JoAnn treated Dan's Achilles again a few days later and he was about 95% better. He got back to running, kicking, and never looked back. He also registered for the Graston Course the next day. Dan regularly uses Graston Technique in conjunction with other manual therapies, and corrective exercise in the treatment of his patients. He says "It is simply the best way to loosen soft tissue restrictions that I have found."